This is such a great little animated movie! I was interested, but I didn't know how much I'd like it. 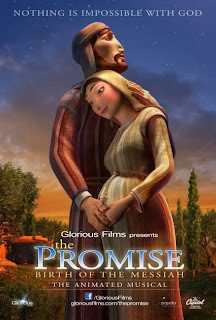 The Promise: The Birth of the Messiah is a musical, it is animated, and while that might turn off some little boys (like mine), in the end, it won my family over. So what did we think? Well, we've watched it a couple times through. The first time, Richard (age 9) spent most of the movie complaining that "they're going to sing again" or "seriously, Mom, do they have to sing everything?" Trina (age 7) loved it, but by the end, she was complaining about the music too. Because her brothers were, she later confessed. I went back and read the accounts of Jesus' early life in Luke, and kept thinking I definitely needed to watch again. And yes, I did. What was really great was that the kids were able to watch it through that second time through and actually watch instead of complain about "all the singing!" That time through, they were pointing out all kinds of stuff, and I was noticing a whole lot more detail too. Lots of little clues as to how society operated in that time. And of course, I was noticing just how much of the dialog or lyrics came straight out of scripture. Now, I have to say I didn't really like the way Mary's mother was portrayed. She's a bit of a harpy, and while the idea that she wouldn't believe Mary's report is easy to understand, her snippy, less-than-respectful digs at Mary's father (who does believe his daughter) smack of 20th/21st century feminism. Elizabeth, too, actually. My big kids complained that Gabriel ought to look more like an angel -- you know, a bit of a glow or something. They didn't complain about the singing. They also appreciated how this really conveyed the conflict and "unbelievableness" of what was occurring. But then the angels appeared to the shepherds, and their response was "Okay, now THAT is more like it!" Connor (age 16) commented that he really liked how they took words from the Bible and made them into songs. And everyone noticed how Trina has already memorized some of them. I've got one to give away. You want this, I know you do. US residents only please. I like the fact that the words come straight from scripture. The music :) My girls LOVE music! The music. What a fun way to grab the attention of little ones! Overall story converted into animation. I love the Scripture aspect, it sounds wonderful! Lauren loves anything with music and will likely listen to the musical parts over and over again. I think my little ones will really enjoy the music and animations! What intrigues me about this is that you liked it so much :) I don't mind musicals and have such wonderful children that they don't mind either ;) lol But I'd like to see if it is a good portrayal of the account. The music, animation as well as how it aligns with the true account. I like the idea of my kids learning about the life of Jesus in an animated way. I love good kid's Christmas movies! I hope I can see it and see if this is one :). Accurate to Scripture. Also the music.